There are two methods of Placenta Encapsulation Capsules and I am often asked ‘what is the difference between Traditional Chinese Medicine (TCM) placenta capsules and simple raw placenta capsules’. I am going to explain the two difference but should you need to find out more please call me on 07515123124 and I will be happy to discuss with you. Some clients are drawn towards the TCM placenta capsules while others choose simple placenta capsules, while others are quite undecided about with placenta encapsulationÂ method to have. It’s all a matter of personal preference, but one thing to bear in mind if you choose TCM placenta capsules, is that theyÂ can’t be taken at time of sickness, fever, flu, infection or mastitis. The ‘heat’ from the TCM placenta capsules will encourage the infection in your body, rather the help nourish your body. It is for this reason that I recommend mothers to purchase the placenta essence, as you will be able to take this placenta remedy in replacement of you TCM placenta capsules until your infection has cleared completely. When it comes to choosing which placenta pills you would like I would personally considerÂ both methods of placenta encapsulation. Each placenta method works slightly differently. The majority of my clients book the combination placenta capsules as this gives them the benefit of both TCM and simple capsules.Â Everyone is different and experience theÂ effects in different ways, which is why is a great idea to have both as you can alternate between the two capsules depending on how you are feeling. Traditional Chinese Â Medicine (TCM) placenta capsules areÂ prepared by steaming the placenta with a lemon, ginger and chili infusion and then dehydrated. In Chinese medicine the process of birth and labor and birth is believed to leaves a lot of open, empty space within the body which is considered to be very yin, or cold. Therefore, one major way you can promote healing during the postpartum period is to add yang which is warmth. Therefore by incorporate steam and warming herbs into the placenta during during the process, the final result is warming and nourishing capsules. The Chinese believe that after birth, the mother needs to be kept warm, mothers can only eat warm foods and drink warm drinks, which is why all my Chinese clients have their TCM placenta capsules with the additional placenta essence. Mothers who have taken TCM capsules have reported to feel and have a balanced effect from the TCM placenta capsules, theyÂ notice a gradual increase in energy and feelÂ balanced. Simple placenta capsules areÂ believed to hold more nutrients and vitamins than the TCM placenta capsules as the placenta does not go through a steaming process.Â When processing a simple placenta Â I simply skip the steaming process. It is thought that simple capsules contain a higher hormone content than the TCM placenta capsules, as the steaming process may destroy enzymes and diminishes the placentas nutritional value, although there is no scientific evidence to support this.Â Simple placenta capsules are believed to be much more energising than the TCM placenta capsules, however there is currently no research to suggest this is true. It is very important that simple placenta capsules are consumed within 12 weeks they are not to be kept. The simple method of placenta encapsulation yields a more potent medicine with more hormones and nutrients, compared to the TCM method of placenta encapsulation. Those using this option report a greater a burst of energy upfront and great hormone stabilisation.Â It is very important that simple placenta capsules are consumed within 12 weeks they are not to be kept. 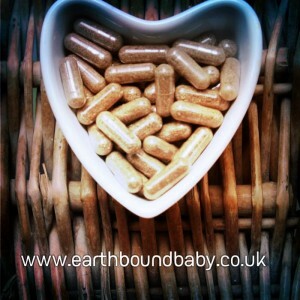 If you would like to find out more about placenta encapsulation and the remedies and lotions please call Amanda on 07515 123124 www.earthboundbaby.co.uk my services cover London, Hampshire, Surrey, Wiltshire and Oxfordshire.